If you are looking for a romantic trip on some of the world’s most phenomenal beaches, a tropical paradise awaits you during your Fiji honeymoon. The people of Fiji are known as the “Happiest People on Earth.” It won’t take you long to realize what makes them so happy. Fiji honeymoons are popular with scuba divers, beach bums and nature lovers. It is constantly recognized as a top honeymoon destination and it is easy to see why. Fiji offers everything you need for romance: immaculate white beaches, secluded private islands, gorgeous sunsets,tropical lagoons, natural hot springs and more. 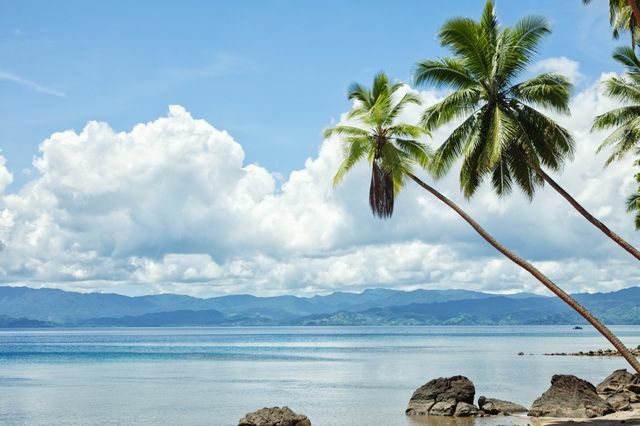 A honeymoon in Fiji is the perfect option for the couple who enjoys gorgeous scenery and romantic excursions (picnic on a private island anyone?). Opportunities to enjoy nature abound. So whether you are they type of couple that enjoys eco-tourism or you prefer simply relaxing in a beautiful location, a Fiji honeymoon can be perfect for you. The peak tourism season for Fiji honeymoons is June to September and December and January. May to October has stunning weather and visitors will miss some of the crowds. November to April is the wet season with heavy rains and humid days. It would be best to avoid this time of year. Snorkeling and Scuba Diving: Opportunities are seemingly endless to take a peek beneath the surface of the crystal clear waters during your Fiji honeymoon. Sigatoka Sand Dunes National Park: Fiji’s first national park. 650 hectares of coastal dunes ranging from 20-60 meters tall. Shopping at the Port at Denarau: Waterfront destination and best one-stop shop for shopping, dining, spa and other activities. Beqa Fire Walkers: Descendants of Beqa Warriors perform an ancient fire walking ritual. Kula Eco Park: Ecological preserve focused on preserving Fiji’s unique flora and fauna. Mount Tomanivi: An extinct volcano and the tallest mountain in Fiji. Located on Viti Levu. Ziplining: Several companies offer zip lining tours throughout Fiji. Natadola Beach: Very popular white sand beach on Viti Levu. Sabeto Hot Springs and Mud Pool: These relaxing natural hot springs and mud baths are the great way to spend a day relaxing. Fiji Museum: Small but informative museum about the history of Fiji. Tavoro Waterfalls: During your Fiji honeymoon, enjoy a half-day hike through the forest to three waterfalls. Excellent views of the coast. Navala Village: Last village in Fiji to use the traditional methods of constructing Bure houses. Sri Siva Subramaniya Swami Temple: A beautiful Dravidian style Hindu temple. Largest Hindu temple in the Southern hemisphere.